We are delighted to see the resurgence of the tuareg and the Blue Man in Brighton having been big fans for a good five or so years now. 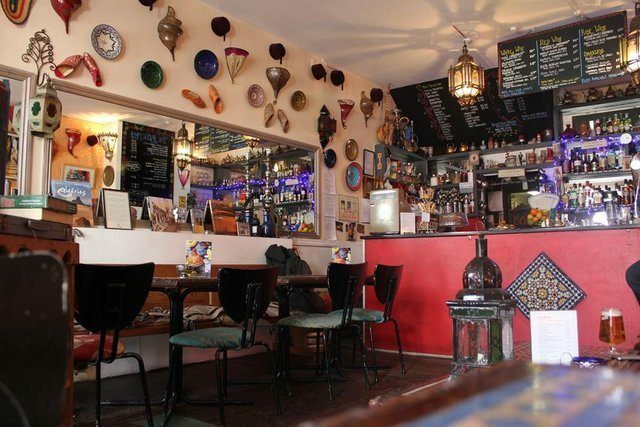 Majid and his team have always offered a really friendly atmosphere, a setting with a difference and the this type of North Africa Cuisine has always been unique to Brighton. The restaurants influences are from the northernmost parts of Africa: Tunisia and Morocco in particular and the fundamentals of Majid’s recipes are passed down through his family, in particular his mother. These areas of northern Africa are massively different in terms of geography, cultural diversity and even politics and it is these factors that give the restaurant a diverse range of cuisine and culinary style. There are so many different dishes to choose from it does allow you to return back to the restaurant time and time again to try something completely different. 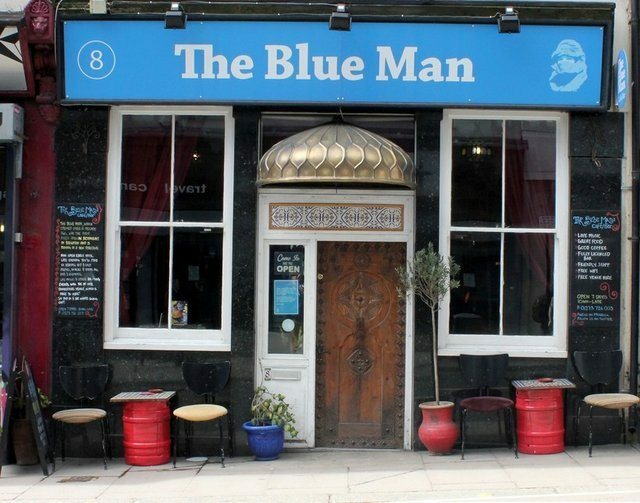 Common dishes which you will see in the Blue Man Brighton are based around common staple foods that you will find in North Africa: seafood, couscous, goat, dates, olives, almonds, lamb and seasonal fruits. 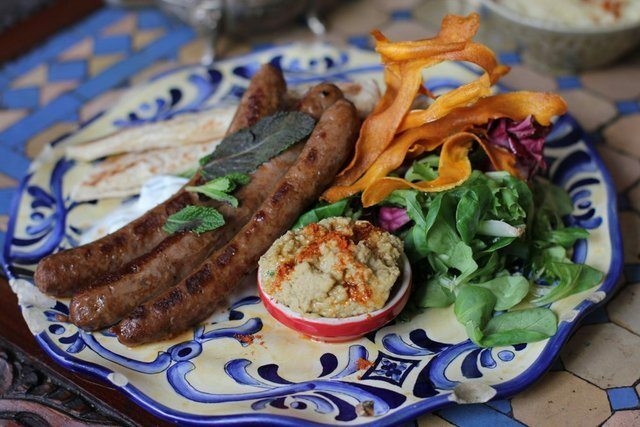 Plus Majid has a mouthwatering recipe for his merguez sausages which we know he goes to a butcher in London to collect. Dishes are spiced but not too spicy and the types of spices they use are cumin, paprika, cinnamon, coriander saffron and ginger. 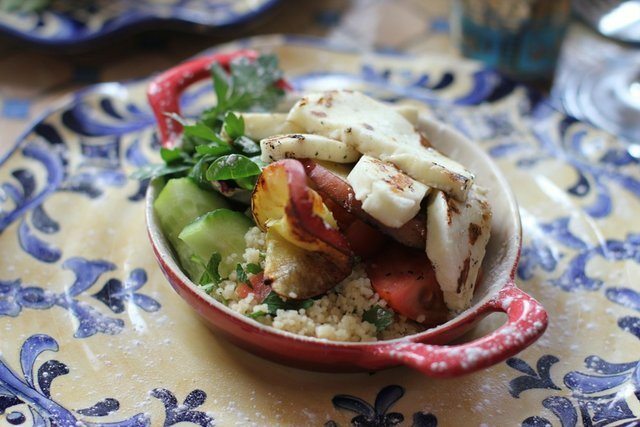 Favourite dishes at the Blue Man include the tajines which are served with lamb, chicken or seafood; this is a dish which is slow cooked and served in a stew type fashion in a traditional clay tajine pot. Without doubt the best complete combination we have ever tried is the Blue Man banquet. This is usually served for 2, 3 or 4 of you and I think on the last count we had about 5 courses in total: hummus (though Middle Eastern) with dips, African salad, olives, merguez, tajines, cakes, followed by a peppermint tea. Great if you feel like treating you and your guests to something special. The Blue Man started on Edward Street in Brighton about 10 years ago. Afterwards, it moved closer to the centre of the city to Little East Street, in the South Lanes. Great for having a drink and a few nibbles in, a casual place to go and have a nice meal in, whether a special occasion, or you just want to go and try something a little different. 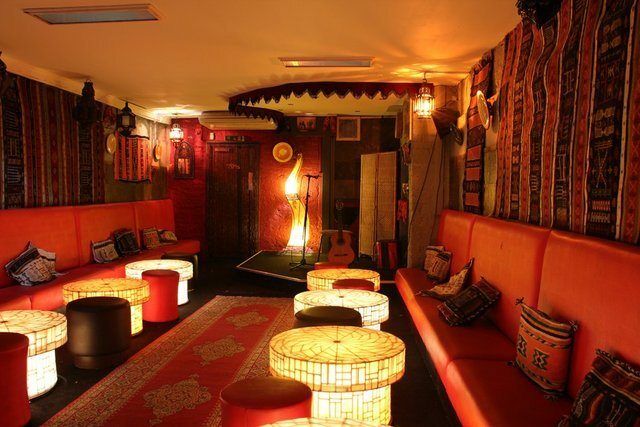 Keep in touch with the venue too and ask about their live music. There are bands which have toured the UK and Brighton which are quite unique which do small gigs for the venue.